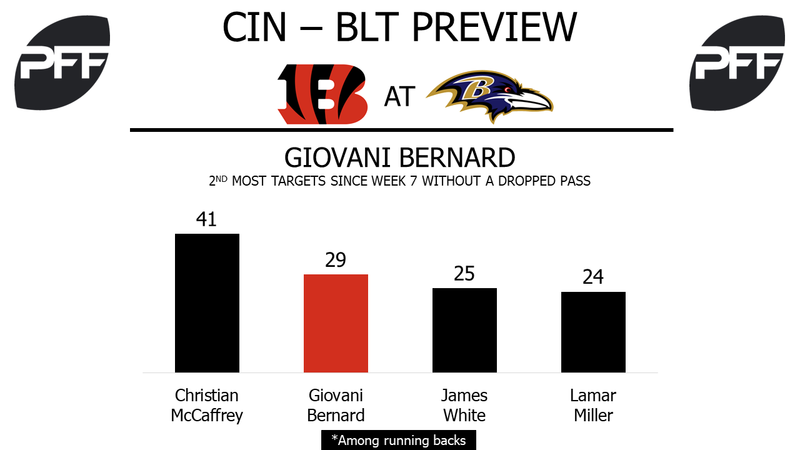 RB Giovani Bernard vs. LB C.J. Mosley – Bernard is coming off of his most productive game of the season last week. In his last four games, he’s forced 10 missed tackles as a runner after forcing five in the first 11 games combined. Over that same span, he has the fourth-highest total yards after the catch among running backs, and he also hasn’t dropped a pass since Week 7. Mosley is tied for being the fourth-most targeted linebacker in coverage this season with 69 targets, but he’s also played the third-most coverage snaps (516) of any inside linebacker. His 37 run stops this season is tied for second-most at his position, but he’s missed eight tackles too. WR Brandon LaFell vs. CB Brandon Carr – LaFell has dropped three passes in the last four weeks after not dropping a pass all season. His 46.3 overall grade this season ranks 101st out of 116 wide receivers, and his 1.06 yards per route run average ranks 76th. He’s averaging a career-low 10.3 yards per reception and he’s produced an 80.0 passer rating when targeted, just 66th-best at his position. Carr is allowing a 71.1 passer rating when targeted, his lowest since 2011, and he’s played the most coverage snaps of any Ravens cornerback this season. His 72.1 overall grade ranks 80th out of 121 cornerbacks, and his eight penalties this season are the most on the Ravens defense. G Alex Redmond and G Christian Westerman vs. DI Michael Pierce – Redmond and Westerman split snaps at left guard last week, and both held their own in pass protection. Neither one allowed a single pressure on 29 and 21 pass-blocking snaps, respectively. Westerman had trouble in the ground game, though, earning just a 32.5 run-blocking grade compared to Redmond’s 81.9 grade. They’ll both have their hands full with Pierce, who’s 86.2 run-defense grade ranks 16th among interior defenders. His 34 total stops are tied for third among defensive tackles and included 32 run stops, which are the second-most at his position. WR Mike Wallace vs. CB William Jackson – Wallace will have his hands full when he’s lined up against Jackson this week. Jackson has allowed completions on just 36.6 percent of targets this season, by far the lowest completion percentage allowed by a qualified cornerback. The next closest is Los Angeles Chargers CB Casey Hayward, who has allowed a completion percentage of 43.7 percent. Through Week 16, Wallace has caught 62.7 percent of his 75 targets. Wallace has been hot recently, however, as he’s graded above average in six straight games. His tough matchup against Jackson this week could break that streak. C Ryan Jensen vs. DI Geno Atkins – Jensen’s run-blocking grade of 75.7 ranks seventh among centers this season, while Atkins’ run-defense grade of 85.4 ranks 21st among interior defenders. In the passing game, Atkins will also be a difficult assignment, as he has accumulated 66 total pressures this season, trailing only Los Angeles Rams DI Aaron Donald in pressures among interior defenders. Atkins has a good chance to dominate as a pass-rusher against the interior of the Ravens’ offensive line, with just once interior offensive lineman having a pass-blocking grade above 70.0 (G James Hurst – 79.7). T Ronnie Stanley vs. Edge Michael Johnson – Stanley will take on Johnson this week, who has been the least efficient edge defender in the league this season (among edge defenders with at least 300 passing snaps). Johnson has just 21 pressures on 302 pass-rush snaps. 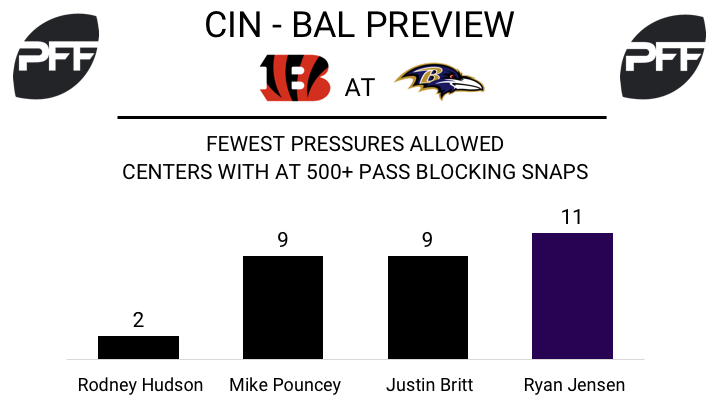 Stanley has allowed at least two pressures in three straight games now but is a good bet to have a strong game against the inefficient Johnson. In the run game, Stanley has graded as the 20th-best tackle in run blocking (79.7 run-blocking grade) while Johnson has graded middle of the pack in run defense among edge defenders (76.3 run-defense grade).